We've come to expect the unexpected from designer Mauricio Affonso. Last we heard from him, the Brazilian-born designer was gluing hundreds of soda can tabs together to form a dazzling spherical pendant lamp. Now, Affonso is focusing his creative energy on tables, and he's come up with an innovative design for an impressive and beautiful folding table that can be expanded, contracted and transformed in just a few easy steps. Affonso’s FAN Table, which is currently on display at the Milan Furniture Fair, consists of a geometric base and a surface that is made from over 400 slats. Both the surface and the base are made of birch. As the name suggests, the table has the ability to fan out, forming a variety of different shapes. At its smallest rectangular setting, the slats that comprise the surface are bunched tightly together. The base can be folded out and the surface stretched to produce a longer rectangular table. 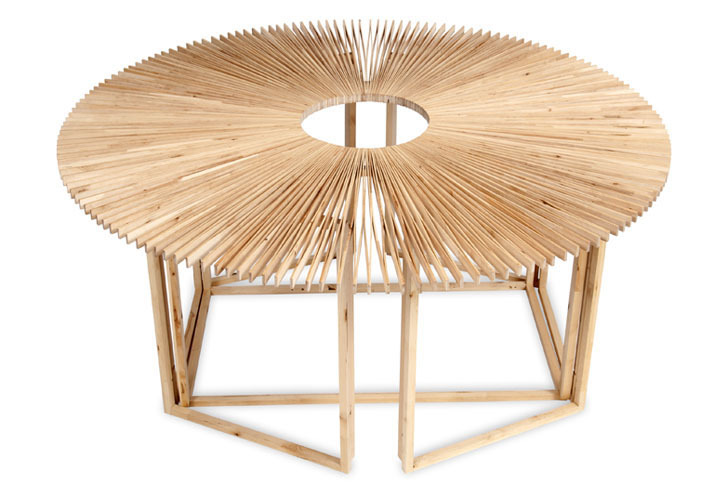 And to transform the rectangular table into a round one, the slatted surface cane be fanned out into a complete circle. Affonso’s FAN Table, which is currently on display at the Milan Furniture Fair, consists of a geometric base and a surface that is made from over 400 slats. As the name suggests, the table has the ability to fan out, forming a variety of different shapes. At its smallest rectangular setting, the slats that comprise the surface are bunched tightly together. The base can be folded out and the surface stretched to produce a longer rectangular table. 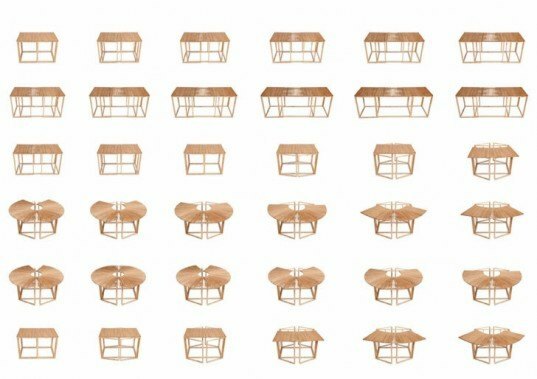 The table's adaptability gives users -- especially those who live in small spaces, for example -- the ability to modify the table to fit a particular occasion. To transform the rectangular table into a round one, the slatted surface cane be fanned out into a complete circle. Affonso says the FAN Table is meant to explore the broader role of tables as infrastructure for social interaction. "Furniture can be quite limited sometimes," said Affonso in a release, "I wanted to move away from the table as an static object and create a self-transforming table that can spontaneously adapt itself to play a new role in the fabric of a situation."